Here’s to my 4th night of Christmas Cocktails for my Mummy. If you are following along, I hope you are enjoying them! 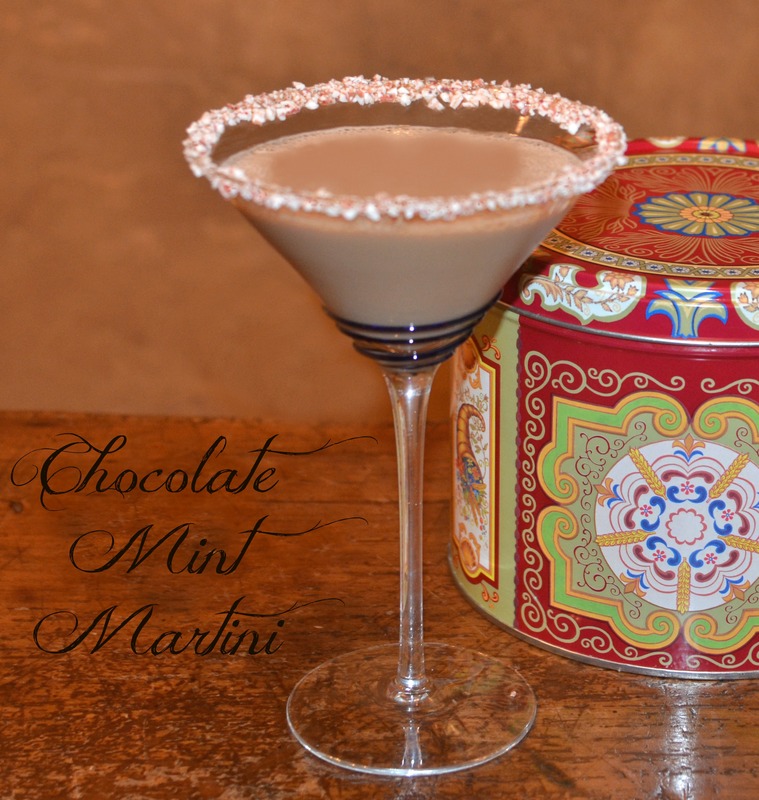 Pour into a shaker with ice and SHAKE SHAKE SHAKE… then pour into your PEPPERMINT RIMMED martini glass. Get some already crushed peppermints from the store (they come in a bag, already crushed) and put a few Tablespoons in a plastic ziploc bag…and crush them some more. Pour them onto a saucer that is big enough to hold the rim of your martini glass. Get another saucer and spread a small amount of thick honey on it. Now, very lightly dip the edge of your martini glass in the honey…NOT TOO HEAVILY or it will just run down the glass and you will have a goopy mess…just a tad…dip dip dip…tiny tiny touches…all around the edge. Now…dip this sticky edge into your finely crushed peppermint pieces. Make sure to get some onto the INSIDE of the glass too. Coat it all over. You can only dip one glass into each batch of peppermint, because once it gets wet from the honey…it gets all sticky and clumps up…and wont stick very good to the next glass. You need FRESH PEPPERMINT for each glass. Yes, it is a bit of trouble…but look how CUTE IT LOOKS on the glass…..so it IS WORTH THE TROUBLE! Just do it. It’s Christmas. It’s not like you do this every night! Now hand the martini to your Mummy and let her give you a great big kiss! You know she REALLY LOVES YOU NOW!